As I mentioned, our church is doing 24 hours of Adoration for people who want to pray before the election. After my husband and I put the kids to bed yesterday I wanted nothing more to go collapse into bed myself, but instead I grabbed my purse and headed out into the night to go to our church. Adoration started after the daily Mass yesterday and will continue until the Mass this afternoon, right around the time the polls close. 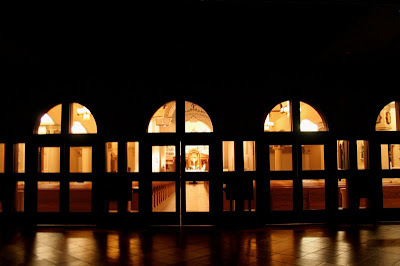 I happened to have my camera with me and took a few pictures from the narthex that I thought captured the feel of the evening nicely. It was late on a weeknight, so I was surprised that there were about 40 other people there. As usual, the group was of all different ages and backgrounds. After I sat down three hispanic teenaged boys dressed in baggy clothes slid into the pew in front of me and knelt on the kneelers to pray. Behind me were some middle-aged gentlemen in business attire praying Rosaries. Last night I didn’t feel any big emotions like I sometimes do. Maybe I was just too tired, but the wave of inspiration that sometimes hits me during Adoration wasn’t there. Nevertheless, something did happen that always happens: after praying in front of the Blessed Sacrament, my thoughts were ordered. There was a clarity there that wasn’t there before, that I did not come to on my own. I look around and marvel at how many people flock to this devotion, and what they sacrifice to do so. Though Adoration last night was in our beautiful sanctuary, many churches hold it in a small room in another part of the church so that Adoration can continue during Masses and other services. There is usually very little visual stimulation, just the exposed Sacrament in a nondescript room and the one red candle. Maybe some flowers or other candles, but that’s usually it. There is never any music. It is always completely silent. There is no “payoff” in terms of sensory experience. Also, the exposed Sacrament can never be left alone, so each church has to come up with an elaborate sign-up system managed by at least one person and a backup to make sure that the room is never empty. In our area there are a few perpetual Adoration chapels, which means that the host is exposed 24 hours, seven days a week, including holidays. Christmas night at 3:00 in the morning? Someone has to set their alarm, get out of bed, and be there. The Fourth of July at 2:00 in the afternoon? Someone is there. The stroke of midnight on New Year’s Eve? Someone is there. I always feel a sting of tears when I see the schedule at an Adoration chapel, seeing the handwritten names in blocks like 2:00 in the morning on a Tuesday or 4:00 in the morning on a Saturday. It’s touching to see so many people sitting there in silence, just spending time with the Lord, often grabbing a Kleenex to dab their eyes. Adoration chapels always have lots of Kleenex. When I think of the impact that Adoration has had on my own life, the intense pull I feel towards it, even when it’s late on a Monday night and I’d rather be in bed, and the way it gets people to behave in ways they normally wouldn’t, leaving their homes in all types of weather at all hours of the night to come sit in a still room in front of a monstrance, I am reminded of an oasis. I might not be able to see Christ’s presence in the Host or even understand exactly how it works that he is there; yet I see the results of him being there. I see how my own thoughts are ordered and transformed by something external to myself, even when I can’t muster up much emotion about it or would rather be in bed; I see what people sacrifice to sit in the same room with him, and know humans well enough to know that you couldn’t get that number of people to do that if they hadn’t experienced something real; I see the Kleenex boxes, the vases of flowers people bring from their homes, the fact that almost every parish can get enough people to sign up to sit with the Blessed Sacrament so that they can host 24 hours of Adoration once a month (and many can have their own perpetual Adoration chapels), and it’s like coming across an oasis of lush, flowering land in the desert. I might not be able to see the running water in a form I’d expect, but I see it in the fat, green plants that could not get such nourishment from anything else. I might not understand exactly how it got there, but I see overwhelming evidence of its presence. Looking around at the flourishing life in an environment where such a scene is rare, I’d know that there is water here. So beautiful! That’s exactly how I felt at Daily Mass today. I was so keyed up this morning, it felt so good to be able to go somewhere tangible and pray. It is posts like these, pictures of your church, explaining Catholic “verbage” clearly, etc. that helps me to understand the Catholic faith a little more. And I quietly admit that I am drawn to it, at least in a “wishful-ness” that there was an area of Protestantism that had something similar to offer on a more regular basis than once a year at a special event or something. Thank you for giving us “outsiders” a clear view into the beauty of it all. That makes me want to run–not walk–to my nearest Adoration chapel. Even it if IS a 140 mile round trip. Very beautifully expressed. Thanks for sharing today. Your perspective on worship is so refreshing. I love everything about this: prayer before an election, disparate folks being united by faith, the beauty of the Adoration chapel, and the fact that you went out into the night. To Pray. But then I read your blog today, and it hit me how incredibly lucky I am. Spoiled might even be a better word – I get the Blessed Sacrament to myself for an hour every week. Nothing on this earth is more important than Him! Thank you for the poignant reminder snapping me out of my self-indulgence; I hope to tend the oasis for many years to come. And suddenly I’m not so sleepy. 🙂 Praise Him who is never outdone in generosity! 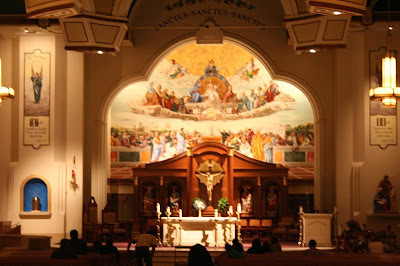 The last time I went to adoration, I was away from home, visiting my boyfriend. He’s in charge of adoration at his school, and he’s the person who stays with the Eucharist for those four hours each week. Because I was there visiting him, I went with him to Adoration. I hadn’t been in over two years. I had a moment of clarity that I find it hard to explain. It dawned on me that I had traveled several hundred miles to spend time with my boyfriend, because I love him. I say that I love Christ, but I never really go out of my way to spend time with Him at Adoration, or in prayer. It’s something that I’m working on, now that I’m aware of it. Adoration can be a powerful thing! I like how you describe it as being an oasis, that’s far and away the best description I’ve ever heard. Adoration is such a gift for us Catholics!! We also had a vigil at our diocese’s cathedral last night, with a pretty impressive turnout. Perpetual Adoration is incredibly special. JPII promoted it and I think dioceses that practice Perpetual have seen positive consequences- after all, with someone adoring Jesus in the Blessed Sacrament 24/7, there’s a constant blanket of prayer! Pretty neat! This reminds me of being in the hospital for six weeks with the twins . . . it sounds strange, but they had one channel on the TV’s at the hospitals that was just a live feed of the chapel. Even if there wasn’t a service going on. And I was so glad it was there; I’d flip past it, or to it, and be reminded, here in this building, where people are living, dying and suffering, here is Christ, here with us. You have a beautiful church too…what a blessing! It was through Adoration that I really developed a deep attachment to the Eucharist. I never had an emotional experience, but being in the adoration chapel, in front of the Divine Presence, just made me need it more and more. It drew me in, totally apart from any intellectual understanding or emotional feeling. I just came to know of the extraordinary power of the Eucharist. We had our weekly Holy Hour today. We just celebrated our 13th Anniversary of Perpetual Adoration at my parish. We had Exposition and a Eucharistic procession with the rosary. Each Hail Mary was prayed for one of the fifty states! My husband started doing a weekly Holy Hour before he even converted. 1-2 am hour…it was amazing to spend that peaceful time in the Real Presence! How humbling it is. A priest on EWTN once said that sitting or kneeling in front of The Blessed Sacrament was like radiation therapy-the love pouring out of the consecrated Host was burning the sin away. God the Physician! I love the image-and what’s more, I’ve experienced just that at adoration. That’s beautiful. Makes me want to go to adoration! Unfortunately, while we are blessed enough to have daily mass here in our small town, there is only adoration once a week for a brief time after morning mass. Where we lived before, there was a 24-hour adoration chapel a few blocks away. Like you, I was amazed at people who go there in the wee hours of the morning, but then I thought of people who work shift work or odd hours and are still able to go. This is beautiful, Jennifer, on an otherwise noisy and cluttered day. Thank you. The Bishop here ask we do a novena. I did and said a rosary each day. I sure hope GOD knows what he is doing. I’m from Illinois. Obama was sworn in on the KORAN for both State Senator and US Senator. He frightens me greatly! aA a mother of 3 preschool age-and-under children, I LOVE going to Adoration during the daytime. The “sensory” experience of the completely silent church, with just my thoughts and also the silence I get to keep for those precious moments is something I long for when I can’t make it. So different from the continuous motion of caring for children, and just as vital for the renewal of the soul. um. i just cried. thanks! I completely agree! I love Adoration and prefer it above every other form of prayer except Mass. Thanks. You know, last week, when coming home from work, twice I felt a strong tug in my heart to go inside the church that I pass every day and pray. Both times (at different hours and in different weekdays), the Sacrament was exposed. (I did not know beforehand). I found this a very solid gesture of love from Him: “I am still your God, come before Me”. I am having a hard time concentrating in prayer for a long time, and several days and nights I just give up, but He never does. What a beautiful post! I don’t go to Adoration often enough. Your post reminded me of why I go. Thanks. Thank you for another beautiful article, especially about adoration.